Reportedly created in 1867 in a New York restaurant to celebrate America’s purchase of Alaska from the Russians, baked alaska became a dinner-party staple a century later. It’s back in vogue, deceptively easy to make and cracking with Christmas cake. 1 Leave the ice cream out of the freezer for 10-15 minutes to soften, then scoop into a bowl and mix with the madeira or liqueur, if using, until combined. Line a bowl (a deep soup bowl about 10cm in diameter across the top should work) with cling film. Spoon the ice cream into the bowl and freeze for 30 minutes or until firm. 2 Cut the cake into 1cm-thick slices and make a 10cm circle to cover the ice cream. (You may need to put 2 slices together.) Sit the circle on top of the ice cream; return to the freezer while you make the meringue. 3 Put the egg whites in a clean bowl, add a squeeze of lemon juice and a pinch of salt. Using electric beaters, whisk on a low speed until frothy. Increase the speed and whisk to firm peaks. Add the sugar in 4 additions, whisking well between each, to make a smooth, glossy and stiff meringue. 4 Invert the cake and ice cream onto a lightly oiled baking tray. Spoon the meringue over the top and sides, and use the spoon to create a rippled effect. Freeze for 1 hour. 5 Preheat the oven to 200˚C, gas mark 6. 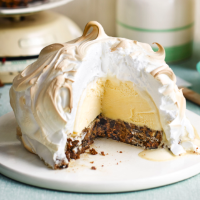 Cook the baked alaska for 8-10 minutes, until lightly browned. Serve immediately.